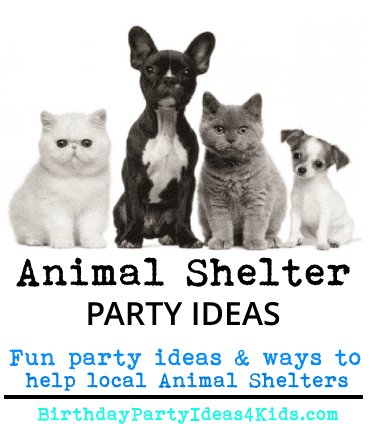 Birthday party ideas for an Animal Shelter party. If your child loves to help animals this is a wonderful charity party that will be fun for all the kids and also help out your local Animal Shelter. Free Animal Shelter Helper Scavenger Hunt item list. Collect items from the scavenger hunt list around your neighborhood and then take party guests to deliver them at your local Animal Shelter. On the front of blank cards (any color) glue 5 circles to look like a dog paw print. One larger circle with four smaller circles (toes) at the top. Call your local Animal Shelter or SPCA and see if they have any cards you can buy ... they might even have information on their organization you can put inside the invitations for the parents to look at and get involved. Party information can be printed out onto large rectangular labels and place them on boxes of animal cookies/crackers. Inside the invitation you can explain what the party is about and ask if they would bring a donation to the birthday party. This can be done instead of a present to the birthday child. Ask for donations of clean used blankets, towels, treats etc. 2. Microwave for 1 minute then stir to blend thoroughly. Add 1/2 tsp. vanilla. Stir well. 3. Place cereal in a very large bowl. 4. Pour the peanut butter-chocolate mixture over the cereal and toss evenly, making sure all the cereal gets covered with the mixture. 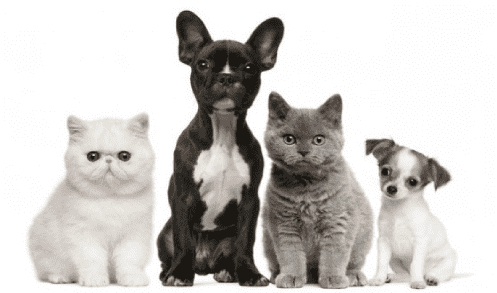 Call ahead to your local Animal Shelter and see if they will give tours of their facility to your party guests. They may even let the children walk a few dogs or pet some puppies! This would be a great time to drop off your donated items. Buy several stuffed puppies and kittens (at least enough for everyone at the party and if possible a few extra) and set them up for adoption. Make shelter cages from empty boxes stacked on top of each other and taped together. Cut a door in the side of the box with "bars" cut out so the puppy or kitty can be seen through the bars. On the outside place a tag that states what type of animal it is, male or female and it's coloring. Let the children adopt the stuffed animals and name them. This is a fun party favor too! Give out adoption certificates with the child's name, date and name of the animal they adopted. Hire a face painter to come and paint whiskers and animal faces on the children. Whiskers are easy ... you can probably do it yourself! See our page of homemade face paint for parties. Fun for all the kids and they are able to help the local animal shelter too! We've created a list of over 20 items the kids can look for and then donate to their local animal shelter. You can divide into teams or since it is for charity send the children out together. Take party guests to the animal shelter to drop off the items. Or take a photo of your child dropping off the items and send it out with the thank-you notes. Fill a small wading pool with sand and hide small prizes deep at the bottom of the sand. Give the guests 15 seconds to dig for a prize (they will have to dig fast and the game will last longer). Once they are done the next child in line must dig for a prize. Hide either real Milk Bone dog biscuits or for smaller children bones cut out of heavy cardboard around the party area. You can give a prize to whoever finds the most or number the bones and they receive a prize based on the number they find. If you plan on doing the Animal Adoption activity you can assign each animal a number and then write the corresponding number on the bones. Once a child finds a bone with a number they can keep it or trade it for another one, but they can't have more then one in their hand at a time. Hide bones without number also so it will be challenging. Small wicker basket to hold their adopted "pet"